This page tells you the things you need to know about your library card. Anything borrowed on your card will be issued to your record. The membership number on your library card and your password / PIN give you access to our eResources. 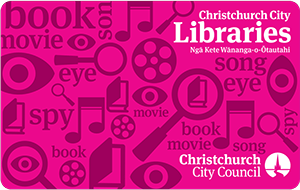 Your library card can be used at all libraries in the Christchurch City Libraries network. You can load money onto your membership account using Pharos to pay for copying, printing, and other library services and products. Take your card with you on holiday as it allows you to borrow from most public libraries in New Zealand. Money owed for charges or lost or damaged stock will stay on your record until paid. If your library account is not used for two years, it is deleted from our records. This is necessary to keep up-to-date statistics for strategic planning and budgeting. Take care of your card. Do not let others use it. Report its loss or theft immediately so that we can stop other people using it. You are liable for replacing materials borrowed with your card until it is reported lost or stolen. There will be a charge for replacement cards. You can pay for copying, printing and paying for internet access with Pharos. Credit can be transferred from your library card or e-services card to your Pharos account. You can load money on your account at any library location; please ask a staff member at the main desk. If you do not qualify to be a member of Christchurch City Libraries you can request a Pharos visitor account. Keep your account details safe so that other people cannot use your credit.